A new Reference tube amplifier from venerable manufacturer Audio Research is always a big deal. Incorporating significant upgrades from its Reference 250 predecessor, the Reference 250 SE mono amplifier features Tung-Sol’s latest high-current output tube, the KT150 as well as new active and passive parts. Reference 250 owners can have their unit upgraded to SE status at the factory, which includes new tubes. Sonically, the Reference 250 SE is the epitome of the “High Definition” tagline of its maker. First, the lack of background noise is startling, especially for a large tube amplifier. It’s so quiet that it sometimes comes as a shock to hear an unexpected instrument seemingly “pop out” of nowhere. For example, I have played the Haydn Cello Concerto with Jacqueline du Pré (EMI) so many times that the record can almost find its own way to the turntable. In the adagio the orchestra slowly sets up the subtle entrance of the cello near the center of the stage. I knew when to expect du Pré’s entrance, yet the background was so black that it was still a pleasantly fresh surprise the first time I heard it through the 250 SEs. That’s one way to rediscover your records. On other material where instruments or vocalists were playing on only the right or left channel for a short period of time, the other channel was so quiet that more than once I had to check to make sure it was still working. Likewise, I frequently listen to the 45rpm reissue of The Red Hot Ray Brown Trio [Groove Note]. Great music, great sound. It was recorded live at the Blue Note in New York City. Still, the instruments were so present in the room and the background so silent, I was fooled into thinking it was a studio recording until, shortly into “That’s All,” the audience started clapping in a wide panorama behind the musicians. After listening to other (even more powerful) tube and solid-state amplifiers for the past six months or so, it required a period of adjustment before I could really appreciate the virtues of the Ref 250 SEs. Not quite as bold or brash as some of the bigger tube amplifiers I have heard at home or elsewhere, it took a while to realize that I was hearing perhaps even more in the recordings than before, but with an uncanny smoothness from top to bottom and lack of edge. The music is all there but with no sense that any particular frequency range is either highlighted or recessed. The sense of air and space is almost (but not quite) as great with the 250 SEs as with tube and solid-state amplifiers in the 600–700 watts per channel range (into the 4-ohm impedance of the Maggie 20.7s), but the 250 SEs had no trouble at all driving these very low-sensitivity speakers to ear-shattering levels without any sense of strain. More importantly, the 250 SEs were uncommonly friendly to those recordings I would often pass over because I sometimes found them harsh or bright to the point of fatigue. Whenever we get new equipment, I think most of us turn to certain “problem” recordings in our collections to see if the new equipment has worked a miracle with that disc. Is my favorite performance of the Shostakovich Fifth Symphony now, finally, listenable? Do the loud passages no longer make my ears bleed? Stepping a little further out on the limb, I think it is often because of difficult records like these that we are looking for the magical piece of electronics that now will allow us listen to the recording with the ease and enjoyment we have been seeking. I haven’t yet found the electronic miracle that makes all recordings perfect. Moreover, we have all experienced new equipment that improves some area of sonic performance but takes a step or two backwards in other areas. But the improvements in listening enjoyment wrought by the Ref 250 SEs are significant, while it is much harder to pinpoint any offsetting deficiencies. Those massed strings on some recordings that used to take on an annoying metallic hardness now sound only like massed violins through the 250 SEs. As a bonus, it is easier to differentiate the individual strings and the air around the string section(s) expands from spacious to billowy. I can now play many of these previously difficult recordings with enjoyment instead of relegating them to their lonely vigil on my shelf. Crescendos that used to instinctively make me lower the volume now sail through the room in all their glory. Sonic peaks do not seem to be compressed; instead, they maintain the integrity of all the instruments, simply played at a louder level—just like at the symphony hall, or any indoor rock concert I can recall. What was previously perceived as glare, either in the recording or perhaps caused by the tubes themselves, is now taken as increased energy without the fatiguing artifacts. I play orchestral music fairly loud, to a level I believe roughly corresponds to sitting in the middle to front of the orchestra section at a live performance. Some of my friends think it may be louder than life, but I usually win those arguments if we are at my house and they have had a lot of wine. I play rock ‘n’ roll even louder, because that is the way I hear it live and because it is fun. If my system won’t give me goosebumps on certain music, from the delicate second movement of Ravel’s Piano Concerto in G to the Rolling Stones’ “Can’t You Hear Me Knocking” to Mama Cass belting out “Dream a Little Dream of Me,” I’ve failed. We all have accumulated this expensive electronic and mechanical stuff to let us enjoy listening to music at home, in a way that brings us maximum enjoyment. In this most fundamental endeavor, the Ref 250 SEs prove to be a valuable part of the arsenal. They will let you get the most out of that string quartet played quietly at night. At the same time, they have the ability to play an orchestra or band at full tilt with a degree of listenability (sweetness perhaps?) and lack of listening fatigue that, in my experience, is rare for a relatively high-power all-tube amplifier. And if the 250 SEs sound like more than their rated 250 watts on my power-hungry Maggie 20.7s, I can virtually guarantee that they will sound like 500 watts on almost any other speaker system out there (more about this below). One of the most interesting aspects of the Ref 250 SE is its tonal palette. 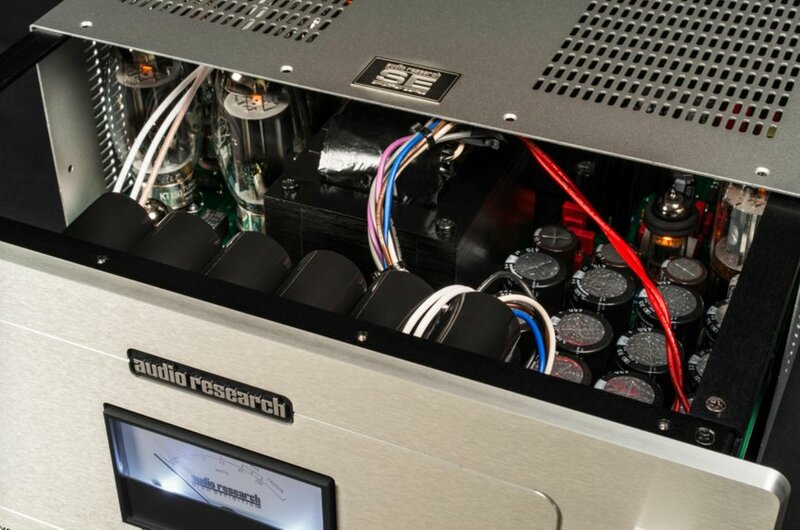 Some reviewers have commented that earlier Audio Research amplifiers suffered from a certain lightening of tonal color, i.e., a threadbare or whitish quality. After months of listening to the 250 SEs, I can report that the tonal color of these amplifiers is anything but threadbare. All instruments are presented with a richness of color that you would hear live. Indeed, this is one of the reasons many of us are addicted to the sound of tube amplification. The interesting part is that while tonal color is fully saturated, it never progresses to the over-ripe or excessive bloom that some tube amplifiers can’t seem to avoid. For example, one of my most cherished recordings is Daniel Shafran playing the Shostakovich Cello Sonata (RCA). Although a clean copy may not be that easy to find, IMHO this is one of the greatest early RCAs and a must-have disc for anyone who loves this music. Through the 250 SEs, Shafran’s cello sounds delicate, full, and vibrantly present with 3-D texture; but it avoids sounding overblown as if two cellos were playing. Nor does it sound more like a viola, a direction possibly taken by some solid-state amplifiers.